This magic mash is fantastic. I first tried it when my boyfriend's sister in law cooked it for us when we went round for roast lunch. It tasted so good, I couldn't wait to try it again. It is so simple to make, and works wonderfully with roast chicken or beef, but equally as well cold, with oily fish, such as mackerel, for lunch. This makes enough for 6-8 people. Wash and halve the beetroots. Peel the swede and chop into large chunks. 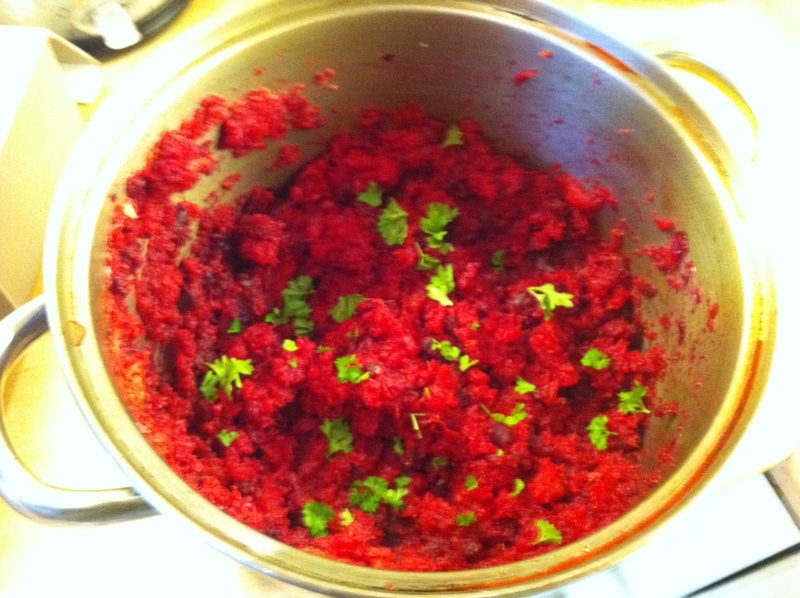 Add the beetroot halves and the swede chunks to a pan of boiling vegetable stock and cook for 45-60 mins, until both the beetroot and swede feel soft when cut with a knife. Drain the vegetables, and carefully peel the beetroot. The skin should come off very easily. Return the beetroot to the pan with the swede and stir in the creamed horseradish. Mash all of it together, add salt and pepper to taste, sprinkle with parsley, and eat with whatever you have available! It is such a vibrant colour, looks stunning on the plate, and tastes even better.